We're holding a two day cup for 3v3 pyro dodgeball! Each team will play three rounds of Swiss in hopes of making Top 8 playoffs, to be held on the 19th. Playoffs will be single elimination with grand finals & loser's bracket finals being bo3. It is vital that you join our Discord to stay up-to-date with any changes. 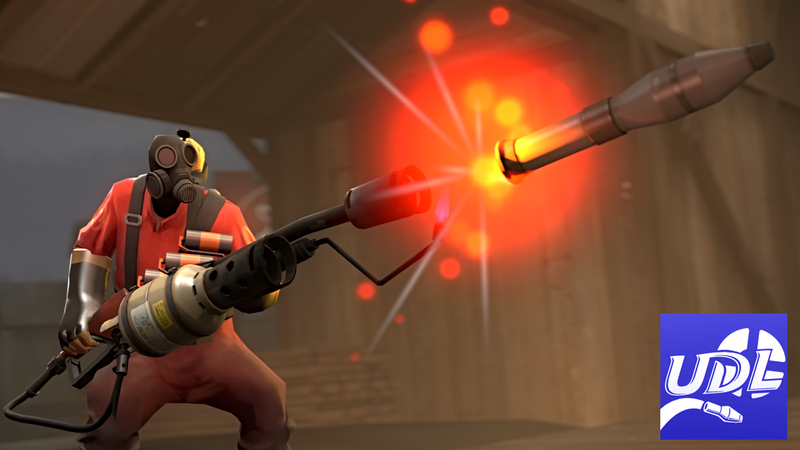 Players will compete as pairs to volley an increasingly fast crit-rocket with the other team. Failing to return the volley results in death & a point for the opposing side. All servers will be hosted by UDL. You will be asked to play at a specific time on a server which we provide. We ask that all team leaders be available online on Discord for the duration of the event, through which connect info for our servers will be given. Please avoid being late as you could receive a default loss; see our 'rules' section below. In group stages, matches have a 10-minute time limit, upon reaching which, the team with the highest score wins. In playoff games, this time limit is extended to 15 minutes. Three games will be played by each team in the group stages, each against a different team. In the event of an uneven number of teams, one team each round will be selected for a bye-match; they won't play a game this round but receive a win. In playoffs, the top eight teams from group stages will compete against each other in a single elimination bracket. These matches will have a time limit of 15 minutes. Map pool to be announced for the playoffs and finals. The best two teams will face off and as a grand final, it will be a bo3 with each map at 15 minutes long. The three maps are selected by allowing both teams to ban a map, after which both teams choose a map to play, with the remaining map acting as a decider. To decide third place, the two teams that won their first playoffs match but lost their second will play against each other in a bo3 lower bracket final, using the same pick/ban system. We will only be hosting European servers during the event, but players from other regions are allowed to participate. In the following circumstances, team leaders must report to the spectator staff member but if not applicable, message Vortexan or Cooli (via discord) to claim a default win. Spectators will be spectating in your games, monitoring matches to issue warnings if teams appear to intentionally exploit the rocket's interaction with players & the map, or otherwise attempt to derail competitive play. While subjective, we believe the following actions go against the spirit of dodge-ball & inhibit skilled play. If spectators see this behavior & consider it deliberate, they may issue a warning. If a team accumulates more than three warnings in a single match, they will receive a loss. Medals will only be distributed to teams who complete the full group stages. Exceptions can further be made depending on the nature of how an individual player acts and plays during the cup.